Now it becomes a LEGO Technic set paving the way for real life construction machines. Volvo Construction Equipment (Volvo CE) and LEGO Technic construction toys have joined creative forces with a team of children to design a futuristic, autonomous construction machine. The result: The LEGO Technic Volvo Concept Wheel Loader ZEUX set, scheduled for release in toy stores in August 2018, and the digital prototype for a real-world autonomous machine. What started out as a fun, informal team building event to inspire The Volvo CE and LEGO Technic design teams in 2016, gradually evolved into an idea for an actual LEGO Technic product. Their goal: Design the construction machines of the future. And now the collaboration has led to number of potentially revolutionary patents. Speaking about the collaboration between the two Scandinavian brands, he adds: “We wanted to cooperate with a premium toy manufacturer, just as we are a premium player in the construction equipment sector. Volvo CE and the LEGO Group together create a perfect match, both culturally and in what we try to achieve in our products – exploring together how we can build tomorrow” Autonomous lawnmowers and vacuum cleaners are already a familiar sight in homes around the world and are generally considered safe to be around. 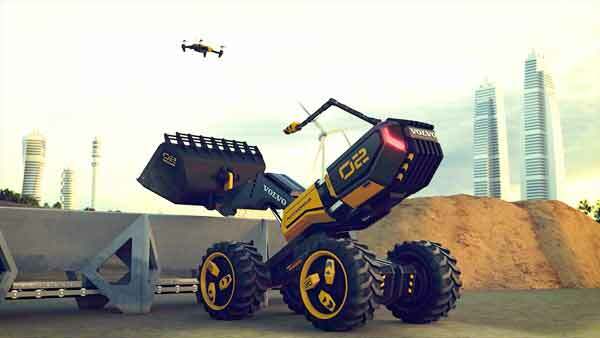 And as the first self-driving cars were tested on roads, the gear wheels were turning in the heads of designers at Volvo CE in Sweden and the LEGO® Group in Denmark, as they worked to find new ways to increase safety and bring a more human aspect to the artificial intelligence in big construction machines. One of the core LEGO Technic design values is the “AFC promise”, which stands for “Authenticity, Functionality and Challenging building”. Models have to look as close to their real-life counterparts as possible, be fun to play with, and inspire builders to try new building techniques. So how does a futuristic model fit into especially the Authenticity part of the promise? • Facilitates co-play: the main and alternative models are both designed for construction site play so the two can work together.